Original 1860s day dress in a light coffee-colored wool with a fine pin stripe. 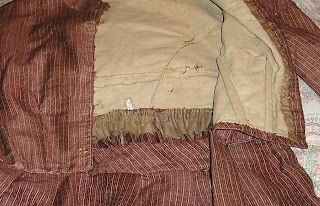 Bodice and skirt are one piece and the waist of the skirt may have been altered to make it bigger. Closes in front with hooks & eyes, most of which are present. Buttons were originally covered in black silk but that has worn away leaving the brown lining cotton. 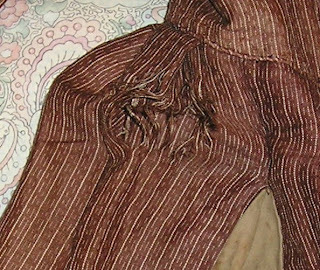 Wide coat sleeves have piping at the dropped shoulder line and a black velvet ribbon trimming the cuff. 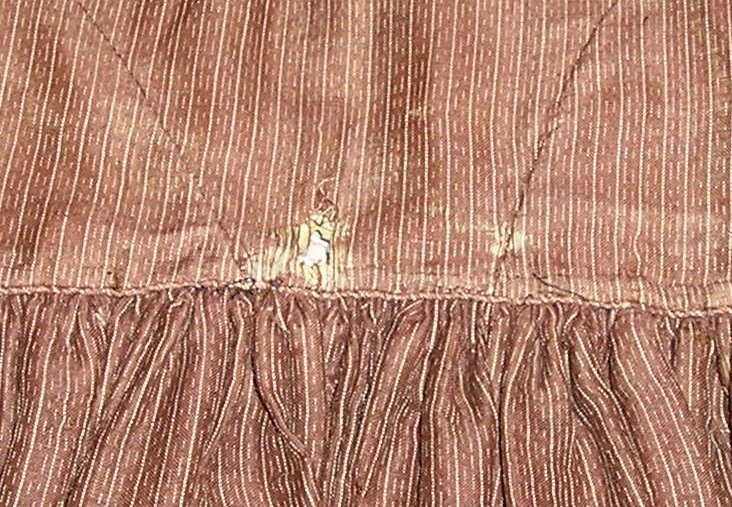 Unlined full hoop skirt with brush braid at hem. 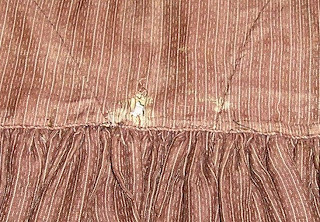 Fabric does show scattered wear and thinning throughout, worst damage I found was the tear near the skirt pocket and a hole in the back about the size of a nickel (could be covered with a belt). Otherwise the dress is sturdy and could be worn with care. 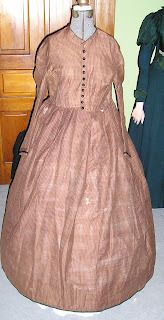 Measurements are: B-32" W-32" Shoulders 16" Sleeves 17" Length 50"
I'm thinking about 1865 give or take a year on this one. Interesting things going on in this one! I wish the interior picture was clearer; it looks like a horizontal seam. Strange measurement proportions; should the bust be 42", do you think? I think they just measured it flat and forgot to take into account the darts - which measure funny if you are doubling the measurement. It's probably more like 34" given the darts.